I'm reading Robert Kershaw's book "It Never Snows in September" and it mentions this unit as part of Kampfgruppe "Chill". I understand that the sPzJägAbt-559 was under command of Major Erich SATTLER by that time (September '44). I'm looking for a good picture of Sattler. I've seen a couple but of very little size. Could anybody help me with this? Many thanks in advance. Highly recommend the book 'Autumn Gale' (Herbststurm) by Didden and Swarts. This book covers the history of the unit and has some good photos of the unit and man you desire. Looking for Wehrpass, Soldbuchs, Award documents, Photos and Paper items from German Units at Arnhem Sept 1944. My country is undergoing a poor economic situation and I can't afford to pay that price right now. My sister, who lives in Chicago, bought for me "Kampfgruppe Walther and Panzerbrigade 107: A Thorn in the Side of Market Garden" through Amazon but I have to wait until I travel there to see her on April. Can't way to see that book! I was wrong on my first post when I said that Sattler was the CO of sPzJägAbt-559 by the time of Operation Market-Garden. I realized this after reading some more information and with the help of Erwin L who confirmed me this. 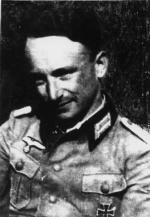 By the time of Operation M-G, Sattler was hospitalized and the CO was Oblt Franz Kopka. Is there any other photograph of Popka besides that one? Could anybody post one? I would really appreciate it. Well, it took some time but finally I,'m in Chicago and got my copy of "Kampfgruppe Walther and Panzerbrigade 107". On page 101 there's a photo of Oberleutnant Franz Kopka. A lot of pics, maps and info to read. An expensive book but I think it's worth the money. Let's start enjoying it.